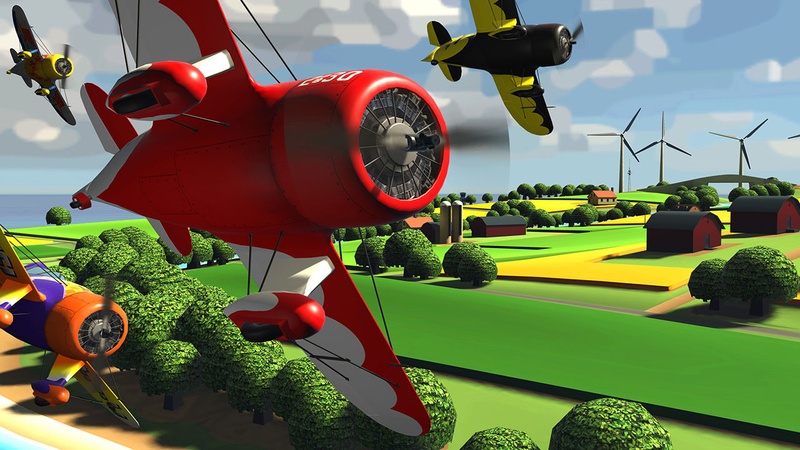 If you've been eager to take to the skies on the Switch, Ultrawings by Bit Planet Games might be worth keeping an eye on. The game is described as an open-world aerial-themed flight game and might even remind you of a certain Nintendo series we haven't seen since the start of the 3DS generation. In Ultrawings, you'll pilot various aircraft while completing challenges on an island-themed world. This includes popping balloons, performing smooth landings, taking photos and participating in thrilling air races. Participating in these events will unlock in-game money, allowing you to gain access to more airports and aircraft. Is this a game you would be interested in trying out? Tell us in the comments. Definitely looks like a poor man's Polotwings but I'll give it a chance and see how this turns out. This is a VR game, why would anyone play this on a flat screen? It should be a LABO VR game. If it has gyro support I'm all for this. Otherwise, it looks like it's design with VR in mind, so analog-only controls would be really annoying. Good point about it being originally designed with vr in mind, however, I'll have to wait, and see. This looks like it might be good. I’ve been longing for more proper flying games since PilotWings 64 (how come that never got added to Virtual Console/eShop?!). I’ll give this a look but even if this particular game doesn’t end up winning me over I encourage more flight genre that’s not simply war-based dog fights. Fingers crossed this turns out good on the switch. I’ve been gagging for a new Pilotwings for years. No I don’t count the 3DS tech demo! My worry is it's one of those games where if you remove the gimmick of VR, you are left with a really dull game. Still, Pilotwings was a joy to play so I can't help but keep an eye on the reviews. As mentioned before, Pilotwings was a great game! A lot of fun in VR but i can't imagine how boring those slow early levels will be without it. Although my lunch is more likely to stay down on the Switch version. and as usual it looks like some uni students homework. would not buy. Quite fun in VR, though I won't be buying the flat version for Switch. Ouch! It’s like if you took Pilotwings and ported it to a C64, and then released it on Switch. If it was my promo video, I’d be embarrassed; show something exciting, for crying out loud. This was on PSVR. a while back. If you guys have a chance to play it there, give it a shot. @Tibob Brilliant Idea. We absolutely need PilotWings, 1080, and Wave Race remade/remastered for Switch. Those are 3 great games. This is my favorite game on Oculus Go. If you can, I recommend playing this game in VR. I've enjoyed this one on Gear VR.... Fun game, but not sure how it'll hold up outside of VR. I like how it looks, but i wonder how their going to port this over to switch, as the game looks very vr based. The music on that video sounds like it's from one of those tv fishing show's lol. I have this for PS VR and to be frank, not even virtual reality can save this thing. It's very, very low budget, and that's evident from the moment it loads up. That wouldn't necessarily be a deal breaker if it was fun, but it simply isn't. The game is incredibly slow, painfully slow even, and the bare bones environments give you nothing to look at while you trundle along at a snail's pace. The dullness is compounded by the awful music, of which there are very few tracks and each lasts around 30 seconds before it loops. I love the original Pilotwings, but this isn't even 1/10 as good as that classic. @ramu-chan so sad to hear this. I would something to scratch the Pilotwings itch! @aSmilingMan There was Pilot Sports which looks closer to Pilot Wings but it didn't review too well. Not sure if it was released on Switch but it's on PS4. Doesn't look very good to me, won't bother with this one. Nintendo are long overdue for a new Pilot Wings game though. I don't know, that art style screams "Fisher Price Toys"... Not my kind of thing, it is either geared toward kids, or a significant budget title. However, I would prefer brand new games over HD remakes. I love F-Zero but every other dude is already begging for it. Plus with Fast RMX I was more than staisfied in the futuristic racer department. Already on iOS and Android, no reason to wait to at least test it out if there's a freebie mode demo or something.